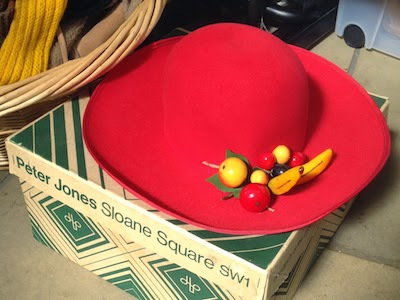 This hat, in that pure vibrant scarlet that defies the camera’s lens, is at first glance quite conventional. But the bunch of artificial fruit, with those, erm, pert little bananas, gives the game away - this dates from that mad period in fashion when it would have been perfectly appropriate to wear this hat with a demure, long sleeved midi dress and perhaps knee boots, or yellow satin hotpants with a Mickey Mouse t-shirt, green striped over-the-knee socks and glittery purple platform sandals. And a Crystal Tipps frizzed hairdo. I don’t know much (ok anything) about glass, but a cursory Google image search suggests this might be Murano. Its Op Art monochrome stripes demand movement to generate dizzifying patterns, so, if you are tempted to invest in this striking bird, I suggest you source a display turntable to show it off to best effect. Stuart never fails to deliver the goods, whether it’s his radical innovations such as the much-lauded cake scotch egg, or his imaginative seasonal collections, or his enthusiastic and creative responses to our fair themes. 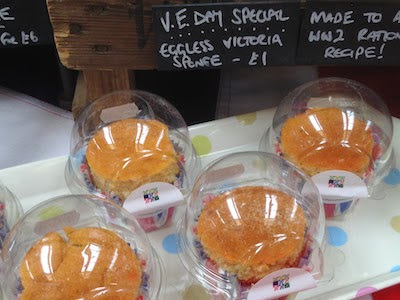 As this fair commemorated the 70th anniversary of VE Day, he offered these mini Victoria sponges, made to an authentic wartime recipe without eggs. The man is a legend! There was a flurry of excitement around Plot 61a’s stall as soon as they started to set up. Beth and Jenny are long-standing VV visitors with impeccable taste, and everyone knew that if they were having a clear out, this was going to be good! After things had calmed down - and half their stock was already gone - I called by to see what was left. This modest little cafetière really appealed to me, and at only £1.00 I’d have been a fool to leave it behind. 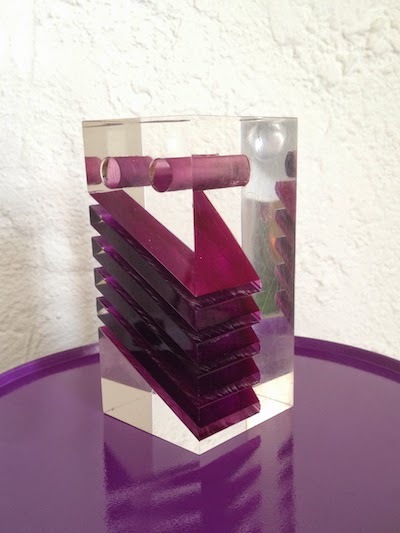 This might look like your average lucite desk tidy with purple accents, but it’s actually a solar prismatic de-re-materialiser. Hold it at precisely the right angle to the sun’s rays and you will be enveloped in a blinding flash of light and instantly transported into a shiny future where everyone wears silver lamé catsuits and hovers around on oscillo-magnetic deconfabulating anti-gravity boots. I saw it in a Children’s Film Foundation movie once, so it must be true. 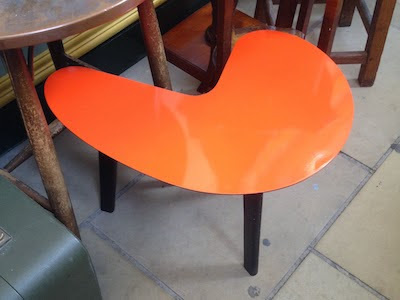 This bold flash of orange caught my attention, but the colour just didn’t sit right with the very 1950s shape of this table. The proprietor, Tony, told me that it was originally yellow - a much more 50s Contemporary-style colour - and that it was painted orange in the late 60s. Whoever did it made a very neat and glossy job of it. So this table tells a story of changing taste; adapting something from a previous era to suit the time. It’s a capsule story of mid-century of design history, and all the more interesting as a result. Their elegantly fluid curves have a slightly unnerving muscular quality, and I reckon you would need at least four to take full advantage of their interlockability. Despite this, they make a very stylish pair at a very affordable price, and their modular potential could be the start of an endlessly variable construction. Having failed (or rather, forgotten) to secure the services of a guest Finder of the Fair, you’re stuck with me this month. 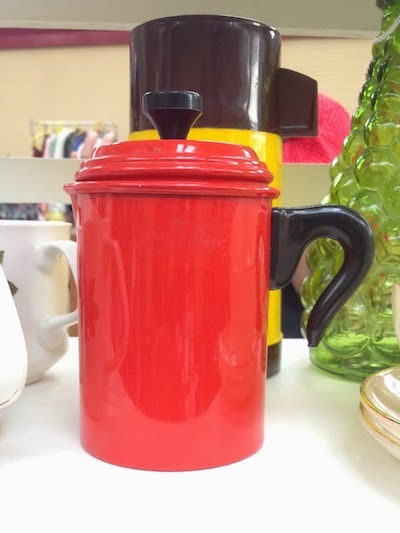 I’m Sarah, one half of the Vintage Village Ltd, and I would class myself as a totally undisciplined collector - if I like it, and can afford it, I get it - and then work out what to do with it later. There’s nothing I like better than the chance to dash around the market hall speed-browsing all the fabulous goods the traders bring along, and catching up with everyone’s news. 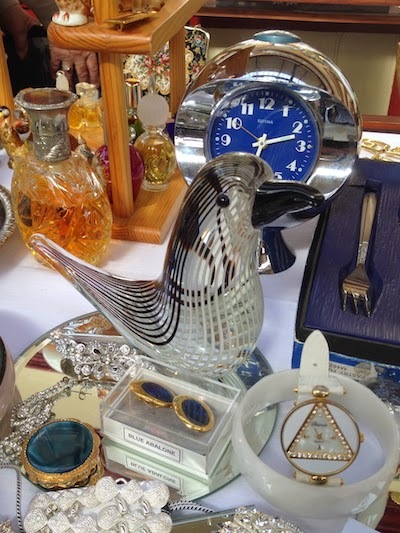 Here’s some of the things that had me reaching for my camera - and sometimes my purse - at our VE Day fair. 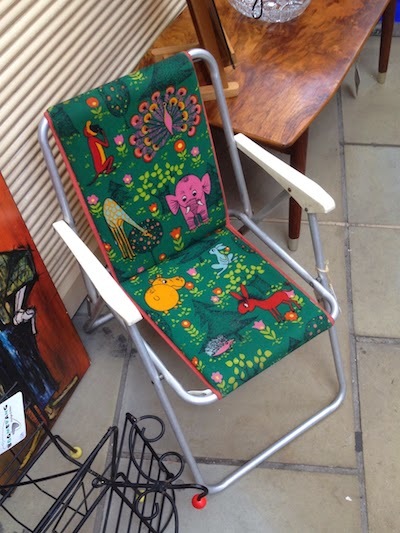 Ah, camping chairs! They have such warm and happy associations - with summer holidays, sunshine and barbecues on the patio. You don’t have to look hard for adult versions, but this petite child’s size example has got to be pretty rare. Especially with that exuberant animal print cloth. There’s a nicely witty detail of a giraffe bending down to pick fruit off a tree too. I hope someone snapped this up for their little precious. It’s worth it for the print alone. Before desk-top computers and i-things, what did you have to distract you from your work? Well, some canny manufacturers decided that kinetic toys were the answer. 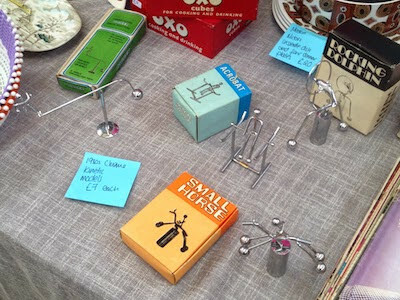 Lucie of Shady Lane Vintage had some mint and boxed examples that I dithered over for quite some time. Sadly, I couldn’t decide which one I liked best - and I tried them all out - so I took a really duff photo and walked reluctantly away. 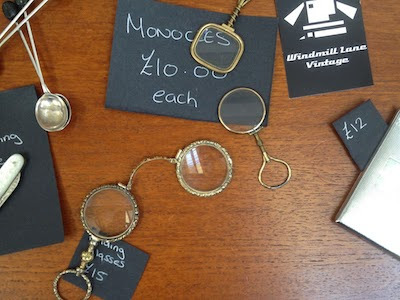 Having consulted my Shire book of Spectacles, Lorgnettes and Monocles, I can reveal that these are in fact ‘quizzers’, but nobody likes a smart arse so I’m letting Jess of Windmill Lane’s description stand. In fact, I’ve just learned that monocles developed from quizzers, and both were worn on a cord or ribbon, so she is, more or less, correct. These neatly engineered pieces had a certain charm for me so I took the square one home to add to my spectacles and sunglasses collection. Incidentally, the folding glasses are lorgnettes, and may well date from around 1850 (sadly, it appears that I am a smart arse). You’d swear this was a classic piece of 1960s Space Age design, but Simon Granville told me it was designed in 1983 to commemorate the NASA space shuttle launch. 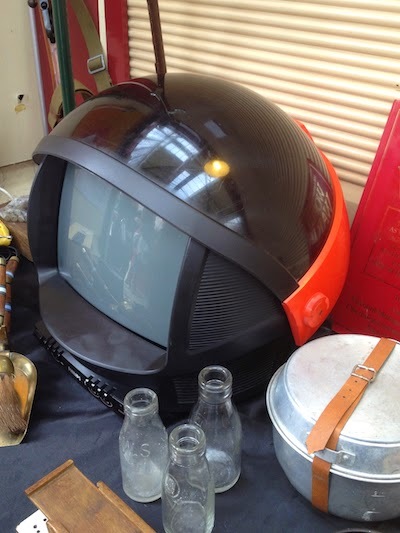 Bit of a punt here, as this novel television hasn’t been tested and was being offered as ‘display only’, but what an iconic item! 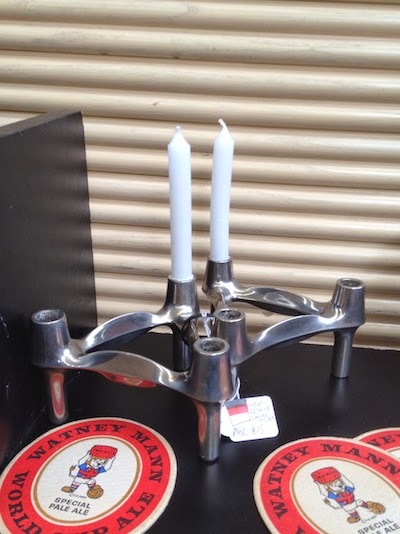 I’ve guessed the approximate date of these, based on that palest metallic pink finish which I associate with the early 1950s, and the late Deco blockiness of the logo, a style which hung around longer than you might think. Stupidly, I didn’t bother to move the gazelles to see what it read, but it looks like ‘Lock’s Soap’, which is charmingly niche. Did people buy soap by the weight in those days? 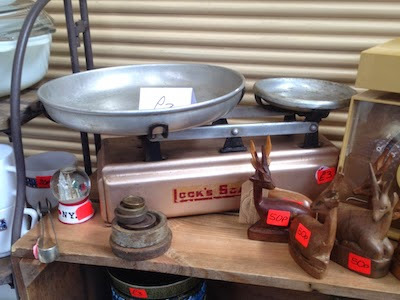 My musings aside, these scales would be a practical and attractive addition to any 1950s kitchen decor, and they’re a screaming bargain to boot. You’ve got to wonder how far you’d get with only five rollers - maybe just the front of your head, or perhaps just the back? Maybe they would work for a curled bob? Catherine and Sue of Lace & Liquor didn’t know either. We need Cathy McGowan to explain it all. Who cares? 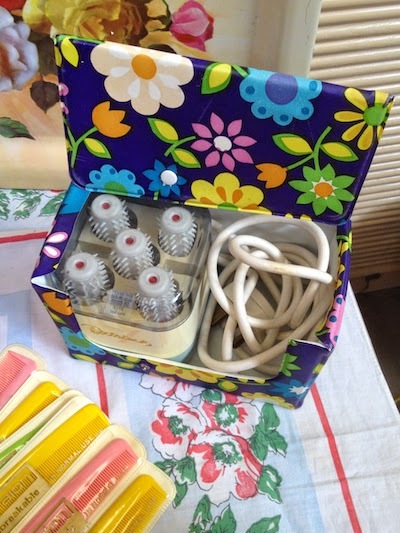 This is such a groovy 1960s item, in a gorgeous floral print vinyl case. You can keep up with my buying adventures, and other trivia and nonsense, on Instagram. I also sell 20th century luggage and various appealing bits and pieces as TinTrunk from a little cavern in 20th Century Stores. Now who wants a go at being Finder of the Fair next? Do me a favour and get in touch!